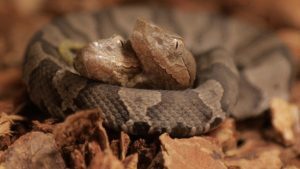 Less than two weeks remain to see a rare, two-headed copperhead snake before the Salato Wildlife Education Center in Frankfort closes for the winter. The unique, month-old copperhead is on display from 10 a.m. to 4 p.m. every Tuesday through Saturday. Time to view the snake is limited, however, as the Salato Center closes for the season after Nov. 21. Salato will reopen March 1, 2019. The Salato Center closes seasonally each year to allow the staff to maintain and update exhibits and facilities. This helps ensure a quality experience for the 50,000 visitors who come to the center each year. During this year’s closure, center staff plan to expand the existing indoor snake exhibit, among other projects. Work to clear hiking trails blocked by fallen trees is planned during this time. Staff closed trails through Davison Woods in the fall, due to the number of trees felled by a severe storm. Fans of the Salato Center can see what’s going on behind the scenes during the winter closure by following the Salato Facebook or Salato Twitter page. The Kentucky Department of Fish and Wildlife Resources operates the Salato Center to educate and inform the public about wildlife and conservation. The center is located off U.S. 60 in Frankfort, approximately 1½ miles west of the U.S. 127 intersection. A bronze deer statue marks the entrance of the main Kentucky Fish and Wildlife campus. Hours are 9 a.m. to 5 p.m. Tuesday through Friday, and 10 a.m. to 5 p.m. Saturday. Salato is closed on Sunday, Monday and state holidays. Admission is $5 for adults and $3 for youth 5 to 18. Children 4 and under are admitted free. The center also offers annual memberships for individuals and families. In honor of Veteran’s Day, all veterans and active military personnel with valid identification will be admitted free on Saturday, Nov. 10.